@RoyalOperaHouse the #ROHZauberflote production is absolutely impecable! Being so close to the screen allows you to savour every detail! ???? 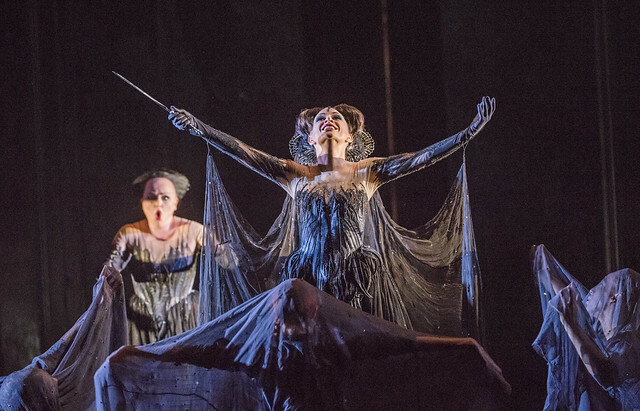 Rebecca Evans as First Lady, and Sabine Devieilhe as Queen of the Night In Die Zauberflöte, The Royal Opera Season 2017/18 © ROH 2017. Photograph by Tristram Kenton. 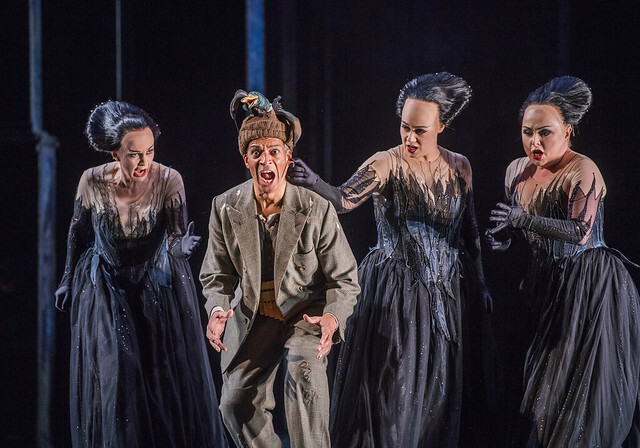 Mauro Peter as Tamino In Die Zauberflöte, The Royal Opera Season 2017/18 © ROH 2017. Photograph by Tristram Kenton. The next cinema relay in our Season is La bohème on 3 October 2017. Find your nearest cinema and sign up to our mailing list. Was Vue Worcester the only cinema experiencing technical problems with the streaming? Very disrupted by break-ups in the picture and sound. Vue Worcester suffered severe technical issues and we're sorry to hear that you were affected. We are following up with them and hope that all will be fixed for the next screening. At The Odeon in Belfast for the live relay last night. What a wonderful evening of opera. The performance was simply superb from the beginning to the very end. 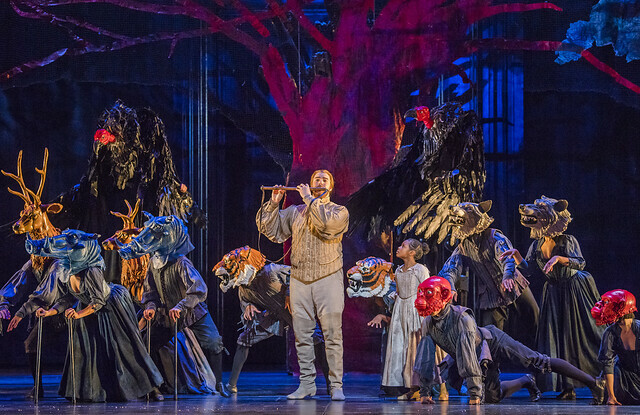 The whole 'ensemble' if that is the right word, from the conductor and orchestra through chorus to principals were absolutely 'on song' This was a triumph for The Royal Opera House. Siobhan Stagg, Mauro Peter (hints of the great Fritz Wunderlich), Roderick Williams, Mika Kares and Sabine Devieilhe all excelled in their respective roles. One highlight after another. The three boys, the three Ladies etc all gave beautiful performances. Three cheers to all at the ROH, backstage staff, and those out front, who contributed to this wonderful evening. Thanks also to the beautiful Clemency Burton Hill who introduced the opera (Oh to be a billionaire and 30 years younger!) The introductions and guides are a great help to a fuller enjoyment of the performance. Bravo and Brava and any other exclamation that is appropriate. Thank you for your comment. We are glad you enjoyed the live screening and it is a great shame to hear about the poor quality. Unfortunately, sometimes venues can experience technical problems, so we will investigate the issue with the cinema concerned in the hope of preventing similar problems in the future. I went to see this production at the Odeon Cinema in Covent Garden, just around the corner. If a case for putting opera in the cinema needed to be made, this was the one to show: a female conductor (much wonderment amongst the public which was clearly taken by her passion for the music and her ability to make it accessible to the un-initiated), breathtaking production, gorgeous scenery and costumes that withstood close inspection courtesy of the cameras, brilliant camera work. And then the music... and the dancers (clever choreography, switching from flames to waves) ... and the singers - every single one of them draw applause in the room and you could hear a pin drop as the Queen produced not just high notes, but high notes at ppp. Oh was she a mean lady! And Zarastro a Reasonable man! Pamina and Tamino really played the romance for all it was worth and I loved the Papageno and Papagena ending up in that huge bed with lots and lots of Papageni. There are too many "secondary" roles to enumerate, but thank you all. Unlike the intervals during the ballet showings, when the public usually leaves in droves to have something to eat/drink and play with its smart phones, on this occasion, this presenter (and the choice of subjects?) captivated her audience - people stayed! Quite a superb production. Went home and googled all the singers and hope I hear them again at some time. Terrific production, good conducting and much fine singing. Slightly slow development in some passages but very enjoyable. Main problem as so often in the cinema was the poor sound levels, which made it sound flat like an old television. No dynamics meant that the low level music was lost. Also rumbles from the screen next door. Can the cinemas be given guidelines as to sound presentation? So cinemas do it well but Cineworld I.o W often do not.. Thanks to the team at ROH for these chances to see/hear great artists/music. Thank you for your comment. We're very pleased to know that you enjoyed the relay yesterday but sorry that you experienced sound issues. Technical guidelines are sent to cinemas every season. We are following up with the venue and hopefully this will be resolved for future screenings. Perfecta en todo, ademas la realización creo que muy británica, propia de Dickens. Me parece que es una nota singular frente a otras teatros de la Opera como Paris. Sigan realizando estas obras de Arte. Agree totally re sound advice needed to cinemas. My enjoyment spoilt by the lack of vitality from ROH Live broadcast , again. Loved it. My wife and I watched it at the Vue in Farnborough. Roderick Williams as Papagano superbly musically funny. All cast were great though. This opera is so relevant today. The search for understanding and enlightenment in this troubled world is really necessary. There is no excuse now for the elitist tag to Opera. Anyone can see these live relays at their local cinema for a fraction of the cost of the best seats at ROH. Can't wait for La Boheme! I enjoyed this superb production from the comfort of my local Est Dulwich Picturehouse cinema. Thank you to everybody that, on and off stage, contributed to this delightful production of one of the best loved Mozart's operas. I particularly enjoyed Julia Jones'passion, Siobahn Stagg's delightful voice, Roderick Williams' voice and amusing interpretation of Papageno with his Papagena, big bed and lots of Papageni, the 3 charismatic boys, the three powerful ladies, the whole clever set up including the snake, the monkeys and particularly Albert, the bird. Just loved it and would like to see them all again in the near future. Unfortunately I was in Llandudno last night to see it and there was no transmission available. The cinema were very good and refunded straight away but I went to see some Mozart! Very disappointed, especially after reading these cracking reviews. Will you be repeating it? We're very sorry that your local screening was cancelled. There will be a chance to see this performance again on Sunday at 14:00. The closest venue showing this is Vue Cheshire Oaks. Not too close I'm afraid but I hope you can attend. I watched this cinema screening at Victoria Hall in Hartley Wintney. It was so wonderful to experience Mozart's marvellous music so beautifully brought to life in this most impressive production and performance by singers and orchestra. Thank you, ROH, for a memorable occasion, I felt uplifted by it all! Truly glorious production! Magnificent in every aspect from the first rise of the baton to the last curtain. Spectacular seamless filming- how do you that? Three hours flew by in a sumptuous and humorous embrace. Even the interval was really interesting! THANK YOU ROH and everyone involved in bringing this production to SO many people all over the world including Newport, Gwent! Would very much love to hear this cast but being in Singapore means getting to a cinema broadcast is impossible. Are there any plans for Radio 3 to broadcast this? Unfortunately Die Zauberflöte won't be on Radio 3 this season. However, our International distributors are in conversations with venues in Singapore and we hope to be able to offer our Live Cinema screenings in that country soon. Very enjoyable performance with strong singing and conducting. A good number and larger than usual audience at the welcoming Odeon Cinema in Trafford Centre, Manchester. Unusually on this occasion the picture did not have the 16 x 9 HD wide screen and was the old 4 x3 aspect ratio with picture rather dim. We still enjoyed our evening. I saw the encore screening yesterday afternoon at Curzon Victoria. Literally the best seat in the house. My only qualm is that being so closely zoomed in on the stage actually compromises some of the illusion of the performance, particularly as the costumes, hairdos, and make up are all designed for audiences sat at a considerable distance from the stage. Also, I thought that the intro contained too many spoilers for those who aren't familiar with the story and like to enjoy the element of surprise when they go to the theatre. My friend and I went to see the Magic flute ar Epsom. My friend a regular opera attendee knew the story well. I was looking forward to seeing the performance as it was my first time for this opera. So disappointed when the surprise of the opening scenes and costumes were ruined by seeing them in the pre show documentary! Felt that the live audience didn't have to watch this so why us ? Plan to see la boheme next week- are you going to spoil this too? Watched the Magic Flute at cinema in Canterbury. Went with an old friend. We both loved it. Voices,costumes and staging best rendering I've seen. We were both delighted and cinema seats really comfortable.Thank you. An old warn down production from 2003, that might have had a meaning once, when it was build up around Keenleyside as Papageno. But the present singer couldn't carry the role of Der Vogelfänger neither vocally or scenically. It was so disappointing apart from the two principal ladies and the three ladies of the Queen of the Night. Roderick Williams gave a performance lacking in any original humour.and his costume was awful. It must have been just me! As a senior with some opera cred, I thought it was slow, pedantic and dark, and greatly helped by boy sopranos and all the puppets and toys. G'pa was a rural mason but this version was weighed down with 'morals' and contrasts between upper and 'lower' people. We are lucky to see young Vic, ballets, plays, opera,@ local movie house in Florence OR.